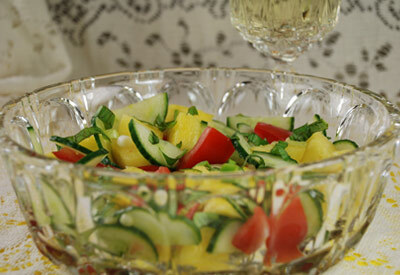 Place pineapple, tomatoes, cucumber and onions in a large serving bowl. Whisk together wine, vinegar and oil. Pour over salad mixture and gently toss. Cover and chill for at least 1 hour or overnight to blend flavors. Just before serving stir and garnish with basil chiffonade scattered over the salad.